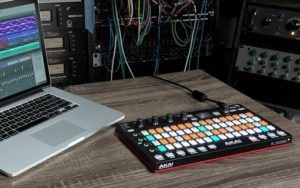 — Akai Professional, a leading manufacturer of music equipment for performers and producers, today announced their newest product, the Akai Fire. 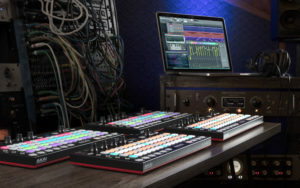 Created in close collaboration with software manufacturer Image-Line, Fire finally gives FL Studio producers a dedicated hardware controller – designed to speed up the creative workflow and enhance the overall user experience. Released shortly after the successful launch of FL Studio 20, Fire celebrates the highly-anticipated arrival of FL Studio to the Mac OS platform, creating a completely new, hands-on way to interact with the popular DAW for PC and Mac users alike. Featuring plug-and-play integration, at the heart of Fire is a 4×16 velocity-sensitive RGB pad matrix. Quickly input patterns on the Step Sequencer or switch over to Performance Mode for live playing and recording of notes and launching patterns. Bringing a tactile, mouse-free mixing solution to the FL Studio environment, Fire includes four banks of four touch-capacitive knobs, enabling the user to instantly see and adjust parameter values. This facilitates a more intuitive workflow, giving the ultimate control over channel, mixer and user-assignable parameters. Enter the groundbreaking, high-powered workflow heard all over the charts with FL Studio Fruity Fire Edition, engineered for and included with Akai Fire. FL Studio is a complete software music production environment, the culmination of more than 20 years of innovative development. The bundled Fruity Fire Edition features everything you need in one package to compose, arrange, edit, mix and master professional quality music. With access to FL Studio’s piano roll editor and step sequencer, 500 tracks, VST & DXi instrument support, full automation functionality, plus 18+ virtual instruments and over a dozen built-in effects and processors, FL Studio Fruity Fire Edition provides the ultimate platform to create fully-produced, great sounding music. This entry was posted in News and tagged akai, akai fire, controller, fire, Fl studio, flux, new. Bookmark the permalink.